We step back into the Webster Kitchen with a really special treat. 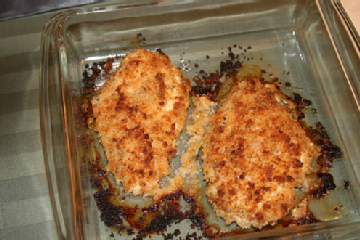 Checkout this easy and delicious recipe for Parmesan Crusted Chicken. We guarantee that you will love it! Coat the chicken breast in the olive oil and adobo and let marinate for 1-2 hr in the refrigerator (If you’re in a rush 30min will work). After the chicken has marinated, combine the mayonnaise with cheese in medium bowl. Arrange chicken on baking sheet. Evenly top with mayonnaise mixture, then sprinkle with bread crumbs.